Welcome to Denmark! Can I interest you in some Fastelavnsboller? What in the world is that?! Apparently, these delicious Fastelavnsboller are a traditional Fastelavn treat in Denmark. From Wikipedia: "Fastelavn is the name for Carnival in Denmark which is the either Sunday or Monday before Ash Wednesday... This holiday occurs seven weeks before Easter Sunday and is sometimes described as a Nordic Halloween, with children dressing up in costumes and gathering treats for the Fastelavn feast. The holiday is generally considered to be a time for children's fun and family games..."
Cool! It looks like the festivities involve eating tasty treats, some very cool and colorful parades, children dressing up in costumes, and some weird parent-flogging activities. Hold your horses! What?! Yes, apparently kids fake-flog their parents to wake them up on the morning of Fastelavn Sunday. There is a hilarious image in my head of a snoring father, fast asleep and drooling, being harshly awaken by the fake-flogging of an over-excited five year old kid on a Fastelavnsboller sugar high! Honestly, I only made enough cream (very soft buttercream really) for one bun, and left the rest of them naked. 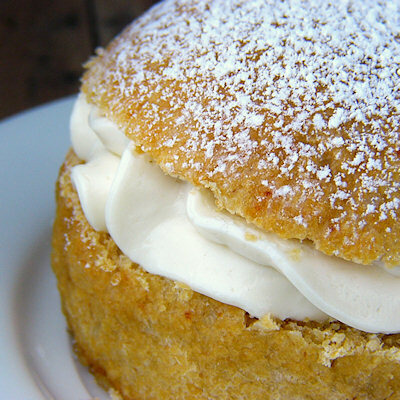 The whipped cream filled ones are very tasty, but I prefer the simplicity of the less-fattening ones, not that I give a flog about fat, but the almond paste filling really shines as the main character here. If you are a proper yeast proofer, then you know what to do. If you're a lazy non-proofer like me, then stir together the flour, sugar, salt and yeast. Pour the milk and Earth Balance mix on top of the flour mix and stir until well combined. If you use a different type of milk or flour you will probably have to adjust the amount of liquid. The dough should be workable but not too sticky. As a lazy non-kneader, I like to knead my yeast doughs inside the same bowl where I mixed the ingredients. So I don't really knead the stuff properly, and I really don't care. Just long enough until the dough is pretty smooth. If you're a proper kneader, then you know what to do. Cover the bowl and let the dough rest for 45 minutes. The dough won't rise much at all. 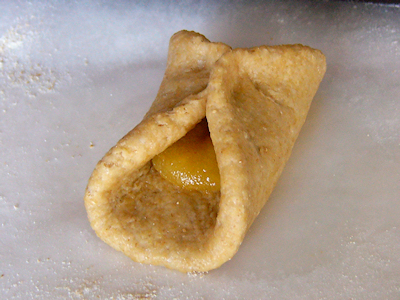 While you wait, prepare the almond filling. To prepare the almond filling, combine the almond paste and Earth Balance in a small glass bowl and microwave on high for a few seconds at a time until the Earth Balance is melted. Whisk or stir until the almond paste and EB are combined and stir in the vanilla extract. Refrigerate until you're ready to shape the Fastelavnsboller. After you let the dough rest for 45 minutes, spray a baking sheet with cooking spray and divide the dough into four equal parts. Roll each part into a ball between your hands. 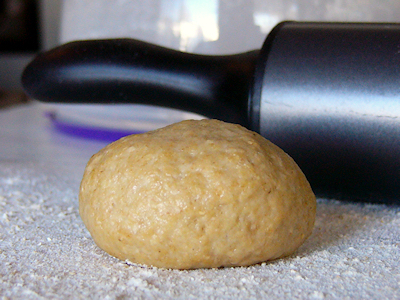 On a lightly floured surface, use a rolling pin to roll out each ball into a flat four inch circle. Scoop 1/4 of the almond paste mix right on the center of each circle. 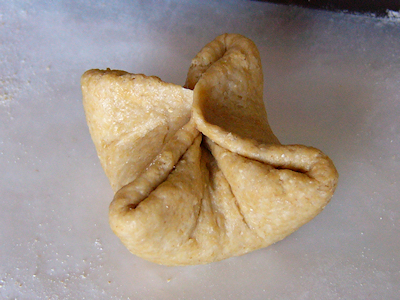 Now you have to wrap the dough around the almond filling, which is tricky. I tried several methods, and I think the one that worked best for me was to bring all opposite sides of the dough up over the filling, much like a cheese danish, and then seal up all all the gaps by pinching the dough with my fingertips. When all the gaps are closed, roll it between your hands to shape it like a ball again. 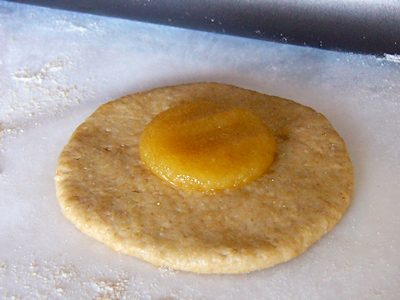 Make sure there are no big gaps left unsealed and place the buns smoothest-side-up on your baking sheet. 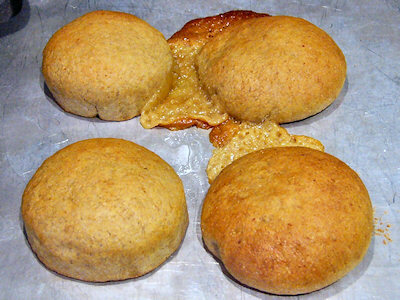 Preheat the oven at 350 degrees F. Brush some agave or maple syrup all over the buns and let them rest for 30 minutes. Not good! That's OK, that was just my first time, the second time I baked these there were no almond explosions. I like brushing some cold water all over the buns as soon as they come out of the oven. It keeps them soft, but if you want them crusty you don't have to do that. 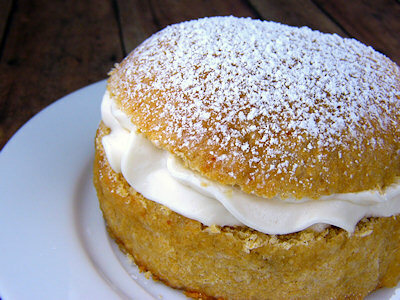 And if you want to go for the whipped cream version, just let the buns come to room temperature, then cut the tops off and fill the buns with your favorite whipped cream or soft buttercream. Sprinkle a little powdered sugar on top for good measure. 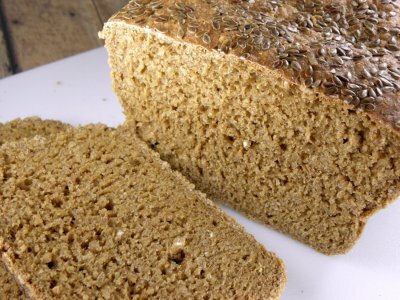 One more Denmark delight before I hop on a plane to my next destination: Rugbrød (Danish rye bread)! Oh. My. Rye! This is quite odd, because I've never liked rye bread. I think the problem was the sourdough, not the rye itself, because I used this non-sourdough recipe (with flax seeds instead of caraway seeds) and now I am hooked! Oprah is to blame for this addiction, because she raved about Rugbrød on her show and I just had to try it. The woman brought home a gazillion loaves from her trip to Denmark. Did she leave Stedman's luggage in Denmark so she would have more room to bring home some carby goodness? Can't blame her! By the way, I created an E.A.T World Flickr Group for those of us who have decided to expand our culinary horizons. You are more than welcome to join and add your own E.A.T World pictures. Oh my yeasty, floury goodness! And I love that the kids flog their parents--such a weird tradition. I'm not sure mine would have gone for it. And now I'm going to have to make that rye bread! SO so SOO wonderful. You never let us down. And now.. your taking on the WHOLE world. Bless you! OMG, YES! These look incredible! I can't say it, but I'd like one please! With cream. They look gooood! The flickr group looks great already, it will be nice to see what people add to it (incase I have missed some EAT World posts from bloggers I'm not yet aware of). See you next week in Pemberley (how convenient- I have an appointment at Lambton next week - we should meet up for tea and scones!! LOL!). Wow! This looks good. I need to move in next door to you and be your official taste-tester. Holy cow! This is perfect. You are a genius. River, you are amazing. Can I give a "Ricki loves your blog" award? ;) Oh, my, those buns (naked or not!)!! While I'm sure I'd prefer the cream-filled ones (I don't give a flog about that fat, either), the plain ones do look good, too. And oh, how I miss rye bread! Fastelavnsboller? Can I hug you? Thank you for this wonderful idea, we are in the middle of carnival...and although I hate the celebrations I love the food! I'd give you an "I love your blog" award, too. This whole eat world theme is so fantastic. 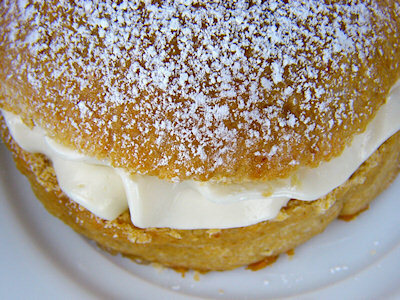 The Fastelavnsboller look nummy on their own, and amazing with the powdered sugar topping and whipped cream filling. 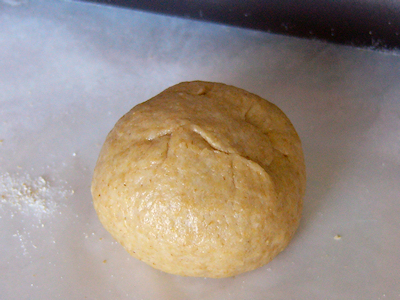 The pics of sealing up the buns are helpful too - I was curious about how to do that the right way. Those sound fabulous! (Especially the ones with the almond filling) I love that you have such different/unique eats from around the world on your blog. both the fastelavnsbolle and the rye bread look so wonderful, River! i absolutely love them both! 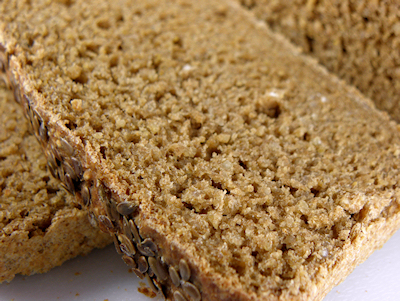 that's great that you found a recipe for rye bread you enjoy, too. mmmmmmmmm! the fake-flogging made me giggle! yay! Kiersten - Thank you! I am loving all the international cuisine too, there are so many dishes and goodies that are undiscovered! Jessy - Thanks!! I cannot believe I like rye bread! What else have I been foolishly avoiding because I think it's yucky? i'd love to try these. thanks for educating me about this tradition! Everything looks delicious! 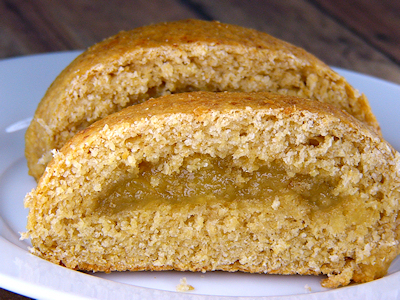 I'd love to try the Fastelavnsboller especially; almond paste is so good! Amazing BUNS! Fastelavn sounds fantastic. I really get a kick out of any celebration that calls for costumes. Thanks for the entry. By the way, you totally deserve the award I'm so glad you got it! thank you for the beautiful blog and instructions for fastelavnsboller! i made them last night, and they turned out beautifully, though i admit, i should have left more marzipan for the buns instead of eating so much of it raw...your boller and rugbroed photos are ab fab, and this is coming from someone who lived in DK for quite a long time! can't wait to try your rugbroed recipe, it's been a long time. and i'm with you, i prefer it SANS sourdough. How lucky that you lived in Denmark for a long time! It seems like such a beautiful place! I'm not a caraway fan either. That's a good tradeoff with the flax seeds, I'll have to remember that. OMG! My daughter and I just made these. They are so good, they made me want to cry a little! She's two and she loved putting the almond paste in the middle. She thought it was brilliant! Thank you for such an awesome recipe! We hope you'll be back soon to blog some more! Thank you so much for letting me know that you made these, and I'm so glad you and your daughter enjoyed the buns! And aren't they fun to make?